Melissa let me guest post on this recipe. I’m responsible for a lot of the savory dishes on the site and while they don’t get as much attention as my wife’s amazing sweet treats, “we all gotta eat.” I’ve been wanting to try a savory pumpkin dish for the fall, and this recipe just popped in my head one day so here it is: Pumpkin Enchiladas. 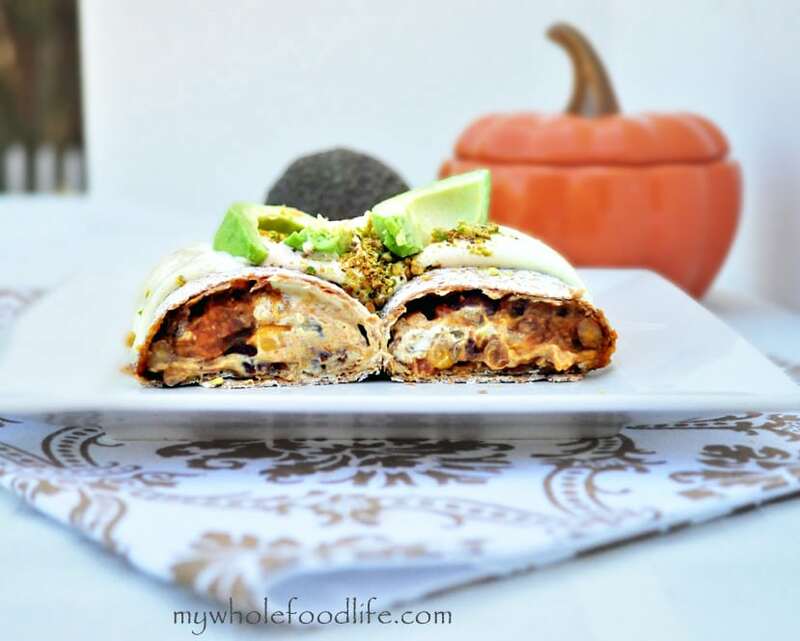 This pumpkin enchiladas recipe is a bit involved, but well worth it. We used a dairy free cheese sauce for this recipe, so these enchiladas are vegan. 🙂 I hope you enjoy them as much as we do! 4 cup black beans (measured after soaking) This also equals about 2 cans. I soaked the black beans the night before. I also roasted my own pumpkin and pureed it myself, but pureed pumpkin in a can would also work. Add everything to the crock pot . Turn on high and walk away for 6-8 hours or so. To put together the enchilada, pick a tortilla of your choice, lay it flat, and put three good sized spoon fulls of the filling slightly off-center in a line. We used Food for Life tortillas. Next add the cheese sauce . I didn’t put an amount because really this is personal taste. Add as much to your heart’s cheese-loving content. We used our cashew cheese sauce , but you could also use real cheese. Lastly, add the red onion. Wrap the filling in the tortilla like you would a burrito or a sandwich wrap. Next, add some more cheese sauce on top. Finally, add your pistachio dust on top of the cheese sauce . I did several at once in an 8X8 baking dish and put it in the oven for five minutes or so. Remove and you are done. A tip on the filling: I did this part at night. I woke up to the most amazing smelling house. For some real heat, you can also throw in a jalapeno to really give this filling some kick. Melissa doesn’t like much spice, so I left that out of my recipe. The filling makes for an awesome pumpkin chili to gorge on. The pistachio dust is essential to this recipe. You can just buy pistachios and food process them until they are course. Real simple. Lastly, for a real cheese option, try this: melt 1 tbsp butter, 1 tsp flour- stirred till the flour smell was gone added dash of nutmeg, salt, pepper, 1/2 cup milk, whisked so it won't form lumps and once thick took off the stove and put in 1/4 cup cheese. I hope you enjoy. I know I sure did. These were great! I actually made the filling on the stove top instead. Thank you! You are so welcome Tiffani! I am happy you like them!